YO!!!! They are casting for an AMERICAN Sewing Bee!!! Guys. AAAHHHHH!!!!! All our dreams are coming true. 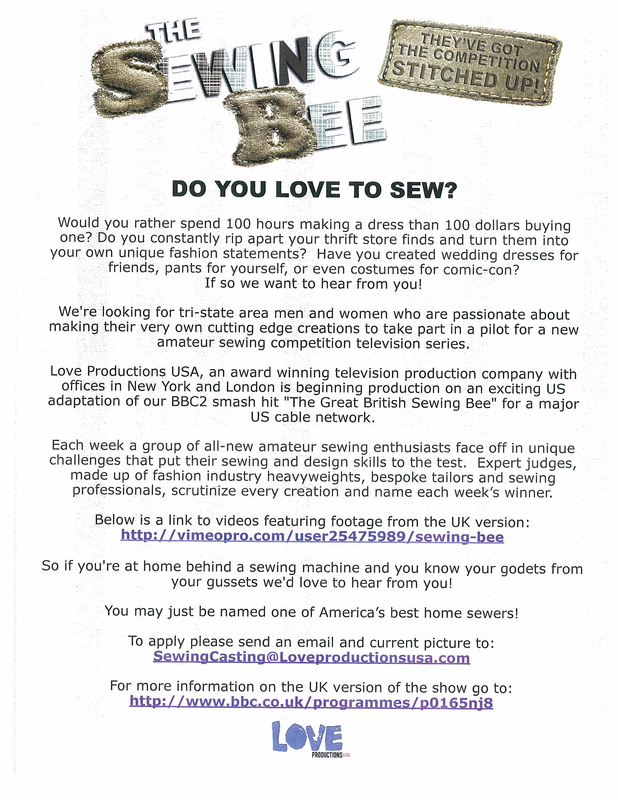 Love Productions is casting for an American version of the Great British Sewing Bee!!!!! Can you dig it? Because, for serious, I can totally dig it! Here’s the deal: They are shooting a pilot for the US version. They are casting (now) for people in the New York/ Philly / Jersey area. You don’t have to live there, but if you are selected / interviewed you’ll need to be able to spend some time up there. And since it’s the pilot phase, I don’t think they’ll be putting you up at a hotel 🙂 If the pilot is awesome and it gets picked up by a network there will be US VERSION!! Remember, this is the pilot phase. Which means they will make a test of the show, shop it around, someone will fall in love with it, decide to order up more and we will get our own version. The pilot may or may not get picked up and it may or may not air. But, the more fabulous you sewists are, the better the odds are right? Finally, a contest for home sewers. Ohmigoodness. Why are you still reading this? Go, go, go apply *right* now. This is AWESOME, and somewhat nerve wrecking, but I think I might try out. Thank you for sharing!!! I will watch religiously from the West Coast at my sewing sisters!!! OMG I NEED TO DO THIS!!! Composing my email right now!!! I know this has absolutely nothing to do with the Sewing Bee (but I’m very jealous that you guys are getting this)…….re the ziplock bag discussion a while ago. I found fabulous zip lock bags in the size you need or even a little bigger at Ikea! Oh, fabulous! I forgot about those. I’ll have to scoop some up! Thanks! Oh man, I hope you’re applying! You would be amazing! I want us ALL to apply (you included!). I’m watching season 2 now and they’ve changed the format a bit. But, clearly the Brits are going for a wide range of abilities, characters and ages. And, sadly, no one we (at least me) ‘know’ from online. Hello – I am happy to read there will be an American version of the The Great British Sewing Bee, even if it is a pilot, I am sure there will be lots of talented people coming forward and that will hopefully prompt the producers to consider more episodes. You may have already read this, if not, there is a lovely interview by Crafts From Cwtch on her blog, about her mum Lynda, who is a contestant on GBSB2. Yay! Can’t wait to watch!!! For NorieCreates and anyone else who wants to watch the British version, I’m posting links on my blog, below.